This rustic styled ottoman will provide a traditional furniture accent to the interior of homes, by being placed in a living room, family room, parlor or den. 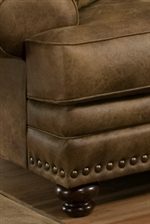 An upholstered piece that evokes a rustic western elegance, this rectangle ottoman features exposed wood legs and nail head trim with a plush seat cushion and welt cord border. 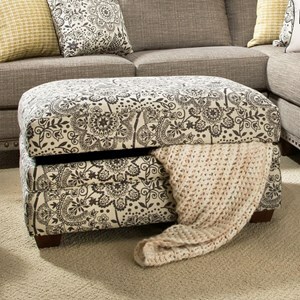 Made for comfort as well as decor, this accent ottoman features a high quality foam cushion that is expertly constructed for dynamic rebound and incredible durability. The perfect size for setting a small serving tray upon or placing ones feet up, this upholstered accent ottoman will decor homes with an antiqued look of elegance. The 817 Rustic Ottoman in Traditional Furniture Style by Franklin at Virginia Furniture Market in the Rocky Mount, Roanoke, Lynchburg, Christiansburg, Blacksburg, Virginia area. Product availability may vary. Contact us for the most current availability on this product. Fabric Options Fabrics and vinyl carefully selected for wearability, seam strength, beauty and comfort. The 817 Group will help you create a warm and inviting living room with subtle traditional style. The pieces in this collection feature plush cushions and over sized arms that will keep you comfortable. Classic details like nail head trim and turned wood feet keep the pieces sophisticated. These pieces will be favorites in your home for both their gorgeous look and their cozy feel. The 817 collection is a great option if you are looking for furniture in the Rocky Mount, Roanoke, Lynchburg, Christiansburg, Blacksburg, Virginia area. Browse other items in the 817 collection from Virginia Furniture Market in the Rocky Mount, Roanoke, Lynchburg, Christiansburg, Blacksburg, Virginia area.